Hi. Thanks for stopping by my little corner of the web. 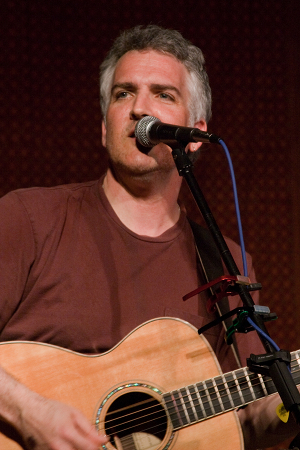 Tom Woodbury is a singer-songwriter who, armed with an acoustic guitar and a handful of capos, sings about his quirky view of the world, blending folk with some tasteful pop and rock. Described as “smart and soulful with something to say,” his songs are heartfelt, often witty, and always honest. Tom’s first full-length album TABLE 10 shows off his well-crafted songs with a top-notch group of musicians. His song “Broken Wheels” was featured on NPR’s Car Talk in September 2009. He once had the pleasure of opening for Livingston Taylor and he’s still grateful that Liv didn’t say something like, “Son, you should consider taking up the oboe.” Instead, Liv used the words “clearly superior songwriting” after hearing him play. He’s willing to entertain comparisons to John Gorka, David Wilcox, and Richard Shindell, but such comparisons invariably make him blush and stare at his feet.